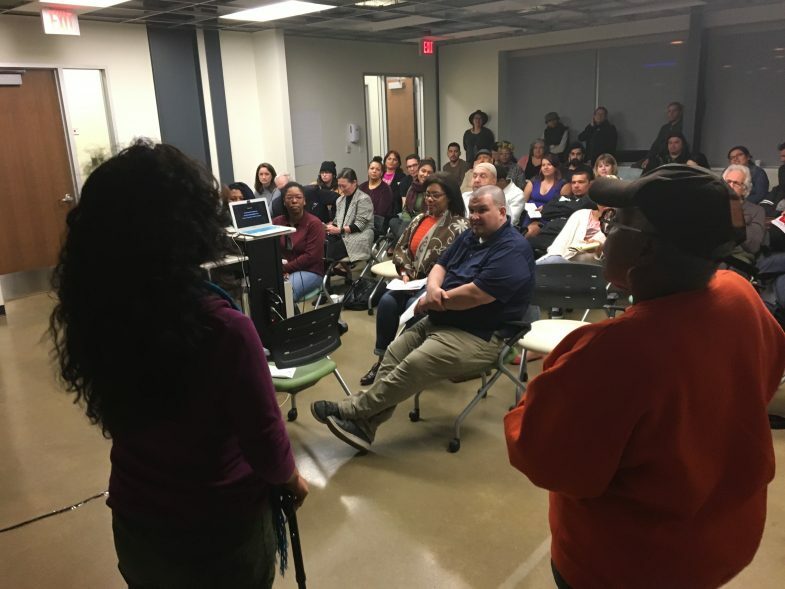 Disrupting Displacement, organized by Edyka Chilomé and Vicki Meek, was part of the Creating Place Learning Exchange series. Photo: Betty Yu. When I was approached by Alternate ROOTS to participate in the Creating Place project, I was honored to be sitting at the table with Vicki Meek – a well respected Black elder who has been living and building in Dallas as an arts community leader for almost as long as I have been alive. I was also pleased by the dynamic of us sitting at the table with a younger white woman who was willing to provide financial support and respect the full autonomy of two women of color in organizing what they felt their city needed. Both Vicki and I agreed that we wanted more than just another publication that might not make it to the hands or consciousness of our communities. I specifically suggested we bring the exploration to the community and make room for learning exchanges with artists in our city – and so we did. A young radical queer mestiza indigenous poet and an accomplished Black arts leader and elder had become “partners in crime,” as Vicki would say. Not having realized it, Vicki and I lived two blocks from each other after I recently moved back into the East Dallas neighborhood where my mother began working almost 16 years ago. After playfully sharing stories in her renovated studio, located in the back of a house where she raised her now grown children, Vicki and I began to organize an event we would call Disrupting Displacement: Arts Vs. Gentrification. We decided to bring together artists from the city and key organizations addressing the housing crisis in Dallas, such as CitySquare and The Texas Tenants Union. 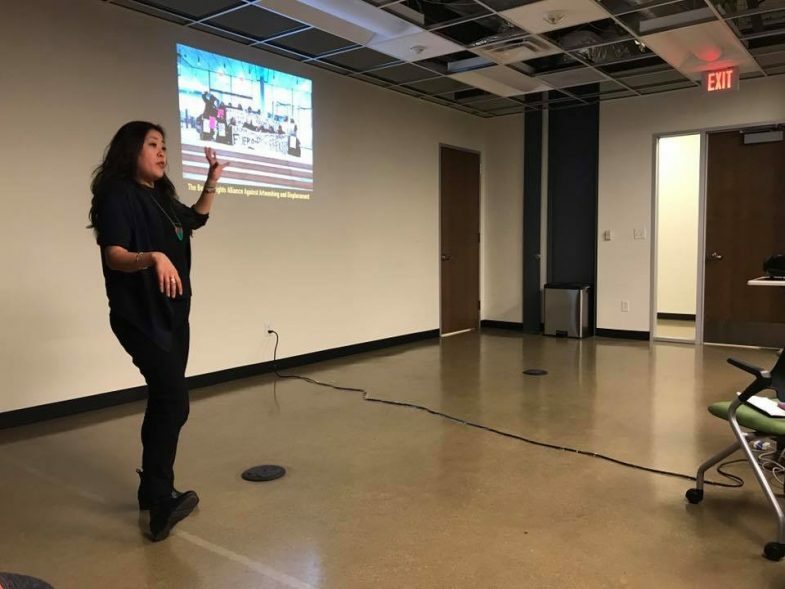 We also decided to intentionally frame possibilities of collaborative strategy with a presentation by Chinatown based arts activist Betty Yu who has years of effective organizing around housing justice. 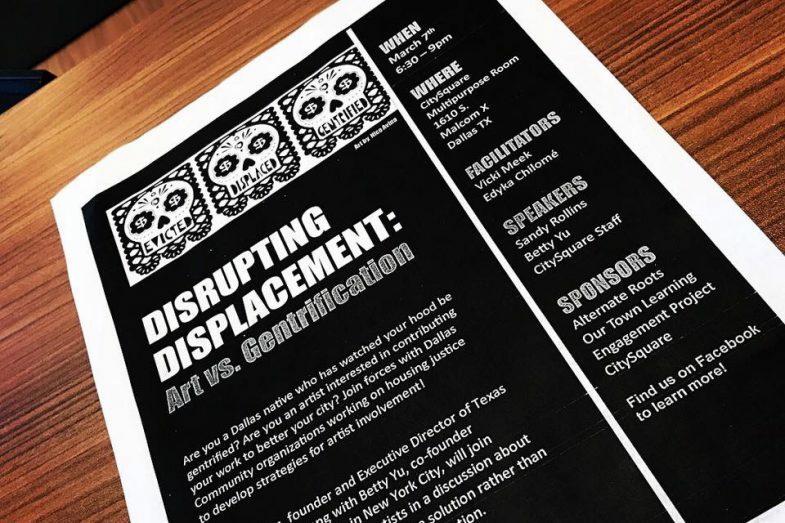 We intended to aim this presentation to artists that are affected by displacement and who were interested in using their craft to help resist gentrification in their city. To encourage the ongoing sustainability of this effort and others like it, we decided to use part of the funding provided by Alternate ROOTS to create a planning grant particularly for artists of color who were born and raised in areas of the city already allotted for “revitalization” and who were active in their communities¹. Excited about this timely effort, Vicki announced the event publicly in a popular Dallas-based online magazine as a part of the new year projections for the art community of Dallas. This sparked important conversation and overwhelming interest amongst communities of color in the city. Arts activist Betty Yu, sharing her work on housing justice at Disrupting Displacement. Photo: Wendy Shenefelt. Soon after, we noticed that a white owned and operated establishment – who was one of the pioneer gentrifiers in the south Dallas neighborhood of Oak Cliff – had, what seemed like all of a sudden, decided to put on a month-long series on the topic of gentrification. This series included an opening event only days before ours with the same theme of art being used to combat gentrification. Adding insult to injury, I had approached the programming coordinator of this establishment a year prior, when a neighboring people of color (POC) owned bilingual literary community space had announced they were being displaced. I had offered specific suggestions on how this establishment could work collaboratively with POC businesses to discuss the issue of violent displacement as a literary arts community in Dallas. I even offered my time and labor to help make it happen. I never heard back from this person and was disappointed to see that they finally took me up on the idea only to unapologetically take all the credit on popular media platforms for introducing this conversation to the city (see “white savior complex”) and proceeded to organize a string long of events that not only did not include voices of color in its direct planning but served to gaslight the already existing POC-led efforts on the topic. It had indeed appeared that our attempt to address gentrification had been gentrified. Disrupting Displacement organizers speaking to a packed room, L-R Edyka Chilomé and Vicki Meek. Photo: Betty Yu. In the depths of my frustrations, I turned to Mama Vicki and others in my community and was reminded of the insidiousness of a living colonial ideology shaped by capitalist interest. This is not the first time, this will not be the last time, and as Vicki reminded me, this changes nothing – we know what we are here to do. It was invaluable for me to have an elder’s energy put this experience in context for me. It reminded me that our communities must stay grounded in the long term sustainability of our actions. We are not here to perform. We are here para sembrar la cosecha, to seed the harvest – and so we did. Part of the seeding was the coming together of two women of color across generations to birth a friendship through stories, love, and wisdom that without a doubt will see its ripple effect for future generations in this city and beyond. In addition, we moved forward with our event which explicitly prioritized and honored the voices of color in the city of Dallas. 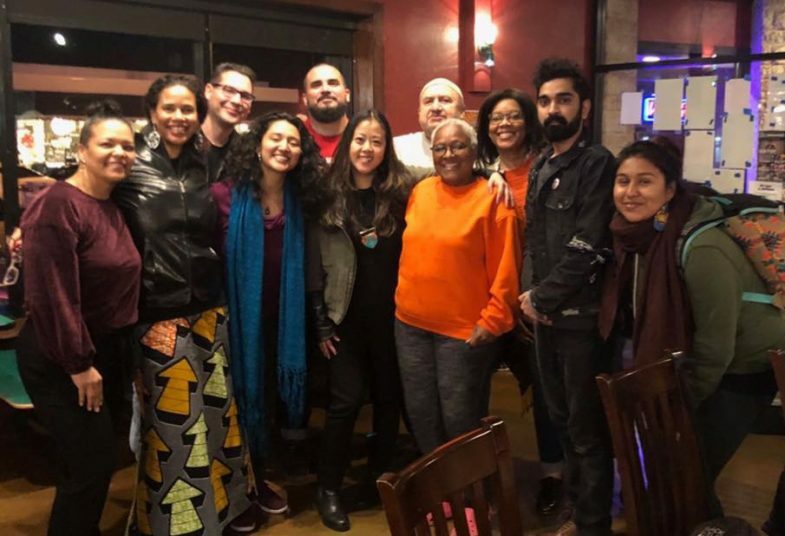 Though just a seed, this event served to open new possibilities for artists of color to collaboratively and strategically resist displacement in more ways than one. As many people of color in attendance noticed, this was very different than the tired and violent troupe of tokenized panelists of color sitting at a table having to endure ill-facilitated conversations and the inevitable voices of white “experts” opinions on our own lives. The constant reaffirmations of gratitude confirmed a desire to see more events like this in our city. It is our hope that this might influence the ways future efforts and collaborations are facilitated. ROOTS members and friends showed up strong for the Learning Exchange. Though I could have chosen to talk about a number of other things in the experience of our Creating Place Learning Exchange here in Dallas, I choose to share this experience, first, to validate all the other people of color who have and continue to deal with the pervasiveness and violence of performative white liberalism. You are not alone. I see you and I hear you, and yes, this is a hot mess. Second, I write this to remind our white allies that though it is important you participate in this conversation, it is more important not to gaslight POCs’ attempts to lead this conversation and/or be in conversation with people of color already organizing around this issue. I also invite our white allies to remember that supporting POC voices means more than inviting POC to speak at your events/panels (especially for free). True solidarity means taking the back seat and supporting/trusting POC to lead strategy and organizing on issues that affect us. Otherwise, you are perpetuating racist organizing practices that are the founding pillars of gentrification/colonization to begin with. Being a white ally and someone that intends to expand their portfolio through justice issues that primarily affect POC requires constant humility and critical self-interrogation. We are all growing and navigating a system of power that pushes us to hop on advantageous opportunities for one reason or another. However, if we are not being transparent, honest, and accountable with ourselves and our community, what are we really doing? 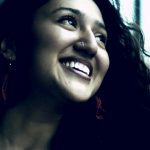 Edyka Chilomé is a literary artist, performer, educator, and cultural worker based in North Texas. She has published numerous articles, essays, and poems including a collection of poetry that explores queer mestizaje in the diaspora titled She Speaks | Poetry. You can follow her on social media @edykachilome or learn more about her work at Edykachilome.com. ¹ This planning grant was awarded to two arts activists – the first being Ángela Faz who is interested in creating a permanent installation that would serve as an archive of POC resistance history in her neighborhood of West Dallas, and the second being Montoya Williams who is interested in planning a mass mail out of postcards educating residents in her community of Pleasant Grove about the dangers of hovering developers and the importance of cultivating intergenerational wealth among families of color.